Whether you are a mid-life professional making a career transition, a recent college graduate without a clear career direction, a retiree embarking on a new stage in your work life or a dissatisfied job-holder who has never before considered a real career, CAREER QUEST CARDSTM© can offer you a practical, portable tool for finding the work that is right for you. 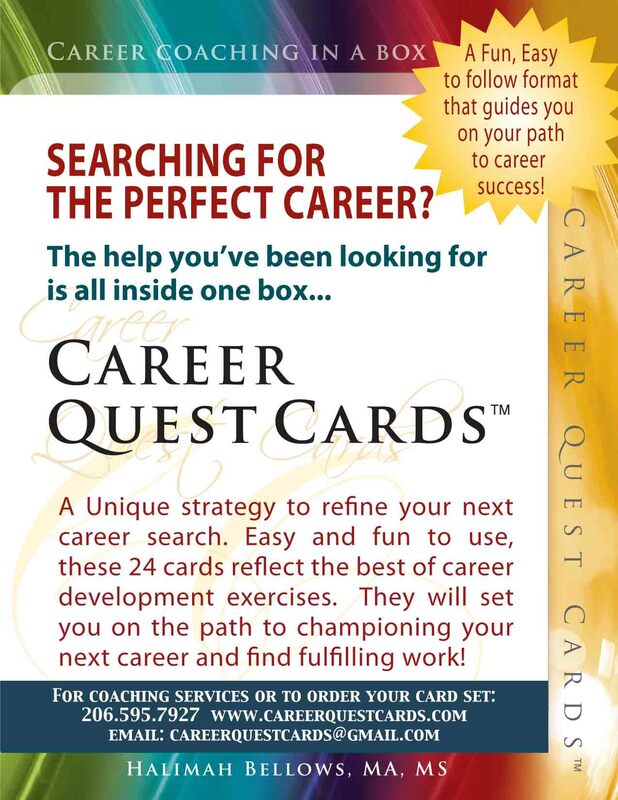 CAREER QUEST CARDS were designed by Halimah Bellows, a seasoned career counselor/coach with more than 20 years of experience championing the careers of her clients. The set of 24 cards provides a distillation of 30 key career-coaching exercises. The cards are color-coded in five categories, allowing the flexibility to work with the cards randomly or use them in a sequence that suits your own learning style and needs. By keeping a journal, you can track the discoveries you make about your values and preferences in the process of doing the exercises. CAREER QUEST CARDS TM© are also available as an app that can be instantly downloaded on any connected iPhone, Kindle Fire or Android device in a colorful, fun, easy-to-use package designed to enable busy users to take it with them on the go as they explore possible paths to career success. Looking for a Career that Brings You Real Fulfillment? Seeking Work that Aligns with your Values and Passions? Need Help Developing a Job Search Strategy? The path to a fulfilling new career is a journey of many steps. Champion Your Career: Winning in the World of Work has been written to serve as a helpful guide and companion on every step of that journey. It is never to soon, to find work that is rewarding and fulfilling. Buy at Amazon, Barnes & Noble, Powell’s online and Books-a-Million.